From temperature and pressure gauges to flow switches we carry the Laars NeoTherm boiler parts you need. We stock a wide selection of replacement parts for a variety of Laars NeoTherm NTH series boilers. 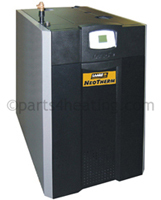 Whether you have a NTH 80 or NTH 500 series NeoTherm boiler, we have what you’re looking for. If you have any questions about our inventory of heating system parts for Laars NeoTherm boilers, feel free to contact us and speak to one our knowledgeable NeoTherm experts today. Used in the NTH399 prior to July 27, 2009.